Make the most of an explosive vape with the Atomic E Liquid. The Atomic E liquid is issued by the creation of Halo, an American brand which we represent the most in the world of Electronic Cigarette. With the Shake 'n' Vape you can benefit with diverse flavaours, fruity, fresh and gourmet. Each Atomic E liquid presents a compostion of 50/50 PG/VG. With the Atomic E Liquid you will appreciate the Bubblegum aroma accompanied with excellent Cherry Flavours ! This Atomic proposes an unctuous English Custard enhanced with a beautiful touch of Vanilla! The American Brand Halo proposes the new collcetion Shake 'n' Vape with the Atomic E Liquid . Each Atomic E Liquid proposes you to appreciate unique recipes. You will also discover the Atomic Mango Mint, the Cherry Bubblegum or even the Lemon Freeze. 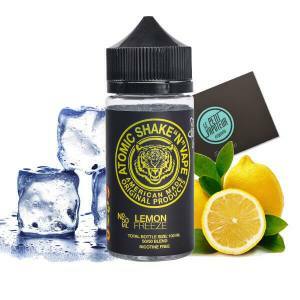 Conditioned in a 50ml bottle, the Atomic E Liquid does not contain Nicotine but can be associated with one or more Nicotine Boosters if needed, depepnding on your preference.